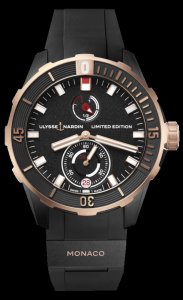 Ulysse Nardin presented their MONACO 2018 Limited Edition of 100 pieces at the MONACO Yacht Show in Port Hercules, in Monaco, France. Presented in a new redesigned 44mm, Rose gold bezel, and Titanium case, this Divers watch features a rose gold bezel, and automatic movement, with date, and 60 power reserve indicator. The glass exhibition case back displays the MONACO logo, and Ulysse Nardin name and anchor. Shown on a black rubber strap with regular pin buckle. PRICE $12,000. 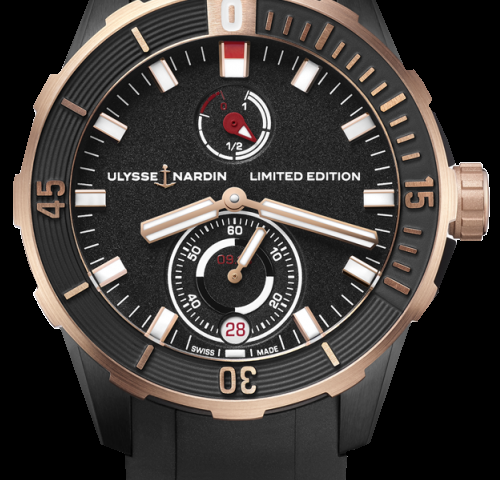 Exclusive Timepieces “Luxury Watches” is an AUTHORIZED AGENT for Ulysse Nardin in McAllen, Texas. Tel. 956.687.2981.